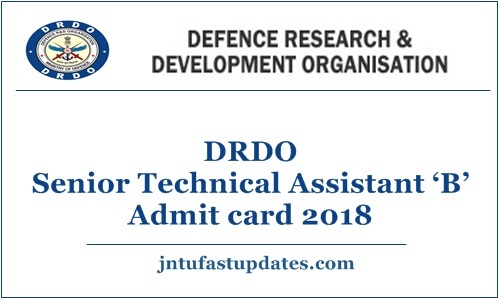 DRDO CEPTAM 9 Admit Card 2018 Download: Defense Research and Development Organization (DRDO) is going to conduct the Ceptam /Senior Technician Assistant B examination from 15th to 18th December 2018. All the applicants who have applied for DRDO posts can get ready to attend the test. The DRDO is going to organize this examination in many examination centers across the nation. Candidates will be given the examination center as per their residing city/region. Aspirants can check the details of their examination venue, date and timings information from the hall tickets. Hall ticket/Admit card is the most required document to carry to the examination. All the applicants who have applied for DRDO posts are hereby informed to download the admit cards before proceeding to the examination. The organization will release the DRDO Ceptam admit card/hall ticket 2018 on its official portal, drdo.gov.in. Candidates can download the admit cards from 30th November, as the organization declares. Hence the competitors who are going to clash for DRDO Ceptam written test can download the hall ticket and keep it safe to attend the test. DRDO is the national level organization that is controlled by the defense ministry of India. The organization working for the Research and Development sector in India. The organization was found in the year of 1958 and consistently rendering its valuable services in various sectors. DRDO has recently announced a recruitment notification for 494 Senior Technical Assistant B Posts. Many of the aspirants from India have applied for the announced posts during the application dates. The selection process includes written test (tier 1 and tier 2) and interview rounds. Candidates qualifying the rounds with the good score will be finally recruited in DRDO. All the applicants who are competing for the Ceptam written test from 15th to 18th December can download the hall tickets from 30th November onwards. Visit the official website of DRDO, Drdo.gov.in to download the admit card. The examination officers will initially check the hall tickets of the candidates and later they will allow them to the examination. Do not forget to carry the hall ticket while going to the examination. Candidates without showing the admit cards will not be allowed to attend the test. Check all the details clearly once after downloading the admit cards. After verifying the details take a printout of it and preserve it safely to carry to the examination. Candidates must also carry the valid identity proof copy along with the hall ticket. They can carry any of the following documents. I have lost my hallticket of ceptam tier I exam..how can i get its copy again. Please reply…..